Our powerful rules engine gives you maximum control over exactly what content appears on your social media campaign, saving you time moderating new content or allocating content to Collections. First, our Rules Engine lets you select content based on your chosen criteria and route it anywhere you want: trash, the moderation area, or any tab on your Hub. When you login to your Admin Console and select a Campaign, you’ll notice a Rules tab. Here you can edit, create, and manage your rules. New rules go into effect immediately the next time we crawl the networks for your content. Note: content already imported by the system will not be affected by new Rules, but all future content will. Choose multiple criteria for unlimited control over content in your social Campaign. For instance, send all posts that contain images, are posted by a given user or users, and use a given hashtag to a special Collection on your Campaign. Remember, these criteria have an understood "and" between them; the more criteria you add, the smaller and more restricted the pool of content the Rule will apply to. Additionally, you can perform multiple actions with your selected content. Choose to add content to a Collection on your Campaign, flag it for moderation, automatically hide or delete it, or simply publish to your Campaign. And of course you can define as many Rules as you like for your social media content. 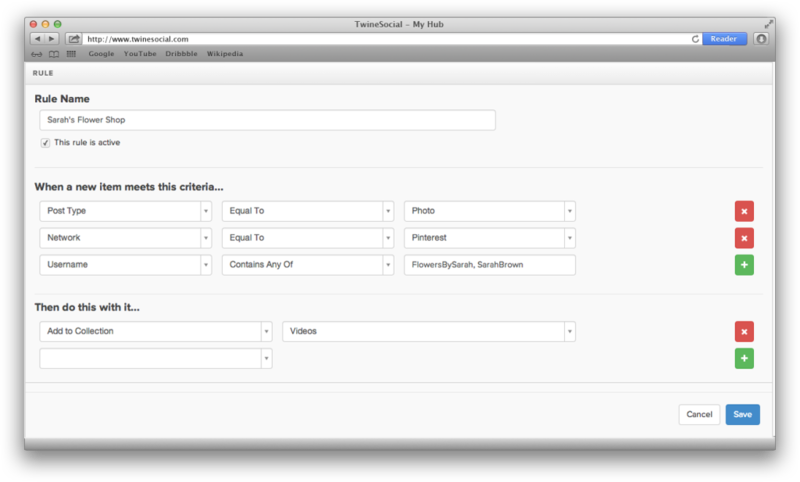 Manage them all in the Rules tab in your TwineSocial admin.